Wait until you hear its Nurburgring lap time. Damn. 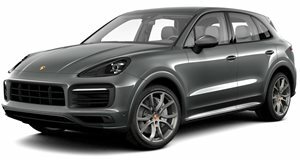 Take the Porsche Cayenne Turbo and re-engineer its 4.8-liter twin-turbo V8 engine and you’ve basically got the Cayenne Turbo S. Making its official debut here at Detroit, the 2016 Porsche Cayenne Turbo S produces a total of 570 hp and 590 lb-ft of torque, a 20 hp and 37 lb-ft increase over the previous engine. This can be credited to the integral turbochargers which are now located directly in the exhaust manifolds, allowing for improved combustion and therefore more insane performance. 0-60 mph happens in only 3.8 seconds (0.4 seconds faster than before) and top speed comes in at 176 mph. Damn. Porsche claims this thing can complete the Nurburgring North Loop in 7:59.74. Damn again. Porsche Composite Ceramic Brakes are standard fare along with a dynamic control chassis to reduce body roll when driving through the curves. There’s also a torque vectoring system and an active all-wheel drive system that permanently drives the rear wheels while offering variable power distribution to the front. 21-inch wheels are also standard along with LED headlights. A sport exhaust system in combination with a switchable sound symposer that transmits the V8 sound into the interior are options. The interior is decked out with leather and carbon-fiber accents. Sales will begin in late April and pricing begins at $158,295, including destination.